Congratulations on landing the new job! The next few months can be stressful if it is not handled properly. You have likely built long-lasting relationships with your current co-workers and management and you will soon cut ties with them and move on. There are several important steps to follow during the resignation and transition period. It is important to immediately notify your current employer about your acceptance of a new position. This should be done in the form of a professional letter that properly thanks them and says that you will assist in their transition. This signed document is essentially a contract to yourself and to your new employer expressing your commitment to the new firm. Be confident and proud as you prepare this document…you earned it! It’s counter-intuitive, but counter-offers are almost always counterproductive for your career. I’m not talking about the give-and-take involved in a salary negotiation. I mean the kind of counter-offer you might get when you announce you’re resigning to take another job. Sure, it’s an ego boost, but a backhanded one, when you think about it. If you were so valuable all along, how come you had to quit to get your employer to recognize it? The simple answer is that most companies don’t have to be proactive in this labor market. They can coast because the demand for talent isn’t that hot and there are lots of unemployed pros out there. No need to spend extra money unless the company is forced to do it. That must be the case because they’ve made you a counter-offer.It looks like you’re in the driver’s seat now. But you’re not. You just think you are. The reason that most companies make counter-offers is so that they – rather than you – are in control of the timetable for transition. 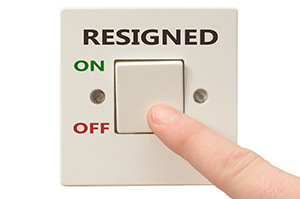 When someone resigns, the general rule is a two week notice period (a month or longer for those in management roles.) That means the company’s got to scramble to find a substitute for the mission-critical role you’ve been filling. Odds are, it’s going to take longer than that to find a candidate who’s going to be a good fit. That’s why they’ll give you more to stay around. While you’re basking in the satisfaction of getting more money and/or a better title, your boss is reviewing resumes and taking her time to interview replacements. When she finds that special someone, you’ll be history. It’s a nasty surprise for the unaware. You might think that being eliminated would be the worst thing that can happen if you take a counter-offer, but you’d be wrong. The worst thing is that you stay, and are – from now on – untrustworthy. Or disloyal. Or an extortionist. It depends on the way your boss shades your actions. The end result is, no matter how you behave in the future, you’ll always be regarded with suspicion. You’ve already shown that you’re ready to leave, so management will be waiting for you to do it again. You’ll be at the bottom of the list for promotions and good assignments. Training? Hah! Why would a company invest in someone whose longevity is questionable? You’ll also be subject to some “Me Too” fears. No matter how discreetly the counter-offer situation is handled, there’s always the possibility that news will leak out. Don’t be surprised if you’re increasingly cut off from co-workers. Management doesn’t want your peers to get the idea that they can wring some more out of the company by copying you. Before you grab a counter-offer, it’s important to think about what’s being offered and what actually brought you to the point of leaving in the first place. A counter-offer is almost always about money. The reasons people leave are almost never about money alone. The reasons people leave are money and something else. Or more commonly, something else and maybe money too. Where’s the something else in this counter-offer? An extra few thousand per year doesn’t change the 60-hour work week and insane deadlines. It doesn’t release you from the boss who doesn’t make decisions and lack of upward mobility. It doesn’t shorten your killer commute. You won’t have to wait for the glow to wear off to be back where you started… because you never left. How long will it be until you’re job hunting again? It doesn’t matter whether they let you go or you let them go. The stress of the search will be the same. And you won’t have as much energy for the hunt the next time around. If you pass on the job offer in your hand right now, what’s the cost of finding the next one? Will you have to pay sooner … or later? Yeah, I know. What if the new job doesn’t work out? What if it’s no better than the job you’re leaving? Better the devil you know than the devil you don’t know. Who knows. It’s just as likely to be a good change as a bad change. At first, it may be hard to tell which was the safe alternative and which was the sorry one. Over time, you’ll get some perspective. And, even if it’s not for the better, for the first months, at least it’s different. That means you take the time to consider their proposal, even if you have no intention of taking it. No matter how cheesy that offer is, make it look like you have to sleep on it. Tell the manager who offers the deal that you’ll need a day or two to think it over. After you’ve rejected a counter-offer, another one may come your way. Your manager may propose a short-term extension for your exit date. If you’re willing and the start date for your new job is flexible, this may be a good way to offset any residual bad feeling. If you agree to this, be sure to set down in writing what the conditions of this extension are. It may be an amendment to your original resignation notice (which also should be in writing), or a separate document. It should contain the dates and details for the extension, including work hours, compensation and responsibilities. It’s really a mini-contract, so be sure to get it signed by the manager before you go ahead with it.